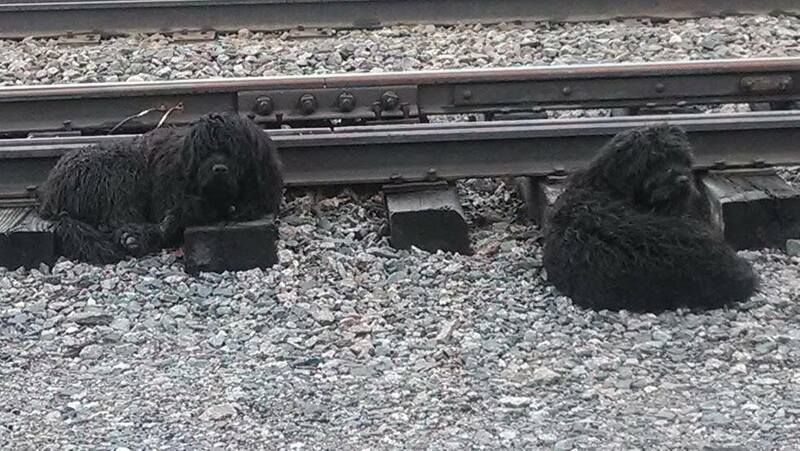 Two very skittish, black, shaggy, matted dogs had been seen roaming the town of Deer River, MN and the immediate surrounding area for at least three months. The dogs looked identical and could have been litter-mates. Many in town had seen them, fed them scraps and even tried to capture them over the course of the time they were being seen. Most often they were spending time near the railroad tracks through town and were also seen on many occasions eating roadkill to survive. Upon hearing the news of the potential of them being shot, a plan was immediately put into place. Two Missy Traps were brought to Deer River. The thought being that we needed to make sure the trap was big enough to be inviting for both dogs to enter at the same time. We did not want to catch one at a time and risk scaring the 2nd off and losing them. Two days and nights were spent with the trap in two different locations, but because we did not yet have them in a predictable pattern or returning to a consistent feeding station yet, we did not catch them that first weekend. However we did see them a couple times and in fact Bobbi Jo had the daring one of the two eating from her hand at one point. The daring one would approach Bobbi Jo, but the shy one would not get any closer than 50 feet. We decided to have Bobbi Jo try to establish a single feeding station and she also spread word to those in town to stop feeding them scraps. Of course we wanted the two dogs to return to Bobbi Jo’s food supply every time and get into that routine. The plan worked great and even more importantly, Bobbi Jo did a fantastic job of even starting to gain the trust of both dogs. Over the course of the next 6 days Bobbi Jo was feeding them 3 times a day and each time, they were excited to see her and there waiting for her to get more food. So one week after the initial trip to Deer River, I went back up and set up the trap right near their feeding station. I laughed as both dogs sat and watched me set up the trap from a slight distance. After set up, Bobbi Jo started feeding them and actually entered the trap and sat down near the back, while I sat in my jeep at a distance waiting to close the gate by killing power to the electro-magnet. The daring of the two dogs went in almost immediately, but it took about 5 minutes before the shy one finally entered far enough to close the gate. We had them both. We named the two dogs Kiro (the daring one) and Bear (the shy one). 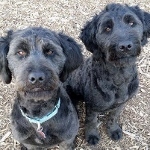 They are very gentle black golden doodles and appear to be young siblings. I brought them back to the twin cities with me and they went to a rescue the next day after spending the night at Jen’s house from The Retrievers. Bear was diagnosed with Anaplasmosis which would explain why he would limp on occasion when seen in Deer River. At last account, they are both doing wonderfully in rescue and got a much needed spa day to get rid of all the ticks and mats in their fur. They will be adopted out as a pair as they are very bonded. A very special applause has to go out to Bobbi Jo, in the safe capture of Kiro and Bear. Her stepping up and making an extraordinary effort to help these two dogs when many would have preferred they be shot, says so much about how she cared for these two. Bobbi Jo was determined and did all the right things in contacting locals and authorities initially, then tracking sightings, then setting up a feeding station which ultimately made the capture rather easy. Bless you Bobbi Jo. Kiro and Bear photographed sleeping on the RR tracks a couple weeks before being captured and cleaned up. Kiro and Bear all cleaned up and given a haircut. This picture was taken by the rescue group that fostered and adopted them out as a pair.